It has been a wild, action packed three days here at the Rio, and the sun has set on Event #16: $1,500 No-Limit Six-Handed. An incredible 1,604 players brought in for this tournament, but there could only be one victor. That man is Matt Matros. 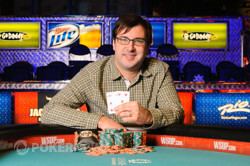 He took home his third gold bracelet in as many years, and oh yeah, also won $454,835 to boot. We started Day 3 with just nine players, and we quickly got down to our final table within the first level. The first victim of the day was Jonathan Currle. He got caught four bet shoving with . He ran into the of Matros, and he wasn’t able to catch any miracles. Mike Matusow entered today with high hopes, starting off today third in chips. Matusow was looking for bracelet #4, but those chances took a big hit early when his queens lost to the ace-king of Ramey Shaio. He was eliminated a few hands later, when his could not beat Robert Muzzatti’s . Matusow’s elimination got us down to our unofficial final table, and this is how the stacks looked as we entered it. It took just one hand for us to lose our first player, and that was arguably the most notable player left in the field, Matt Glantz. It was another race that decided this huge pot, as Glantz held against the of Ramey Shaio. A queen on the flop virtually ended the hand, and Glantz went home in a disappointing 7th. We played six handed for about two hours without losing anybody, or even coming close really. The action was very slow, with the hands rarely getting to showdown. Then, in a flash, we lost three players in six hands! On the first hand, Matt Matros four bet shoved on Mark Darner, who made the call with . Matros had him dominated with . It stayed that way on the flop, but Darner shot ahead when the hit the turn. It wasn’t meant to be for Darner though, as the hit the river, giving Matros a winning straight. On the very next hand, Matros played executioner again. This time his victim was Robert Muzzatti, who held . Matros showed , and the board ran down , giving Matros the knockout. Just a few hands later, Gordon Vayo too met his end. He got it in preflop holding , and it looked like it would be a chop, as he was up against Mark Radoja’s . However, the flop came down , giving Radoja a freeroll for the win. The on the turn was a blank, but the on the river was anything but that, giving Radoja the win, brutally knocking out Vayo. Another hour passed before we lost Ramey Shaio. He was all in with and he was in a race with Radoja, who held . Radoja flopped a ten, and despite hitting a four outer earlier to survive, Shaio couldn’t find a miracle three to come back. The two remaining players were bracelet winners: Matt Matros and Mark Radoja. These two players started today with the second and third shortest stacks, so they both had quite an impressive journey to heads up play. Matros was looking to become just the third player in the last 30 years to win a WSOP bracelet in three consecutive years, while Radoja was looking to make it two years in a row with a WSOP win. It turned out that the former would be making history today. The two were dead even as we started heads up play, but Radoja took a big lead early. However, it took about an hour for Matros to climb back, and the tide turned when Matros turned two pair, and got paid off after a big bet on the river after Radoja tanked for five minutes. About twenty minutes later, the bracelet belonged to Matros. He shoved on the turn of a board, and was snap called by Radoja, who had a straight. Matros held just , but destiny was on his side, as the hit the river, completing his flush, and giving Matros his third bracelet. That wraps it up for us here! We hope you enjoyed the coverage all day! Be sure to stay tuned to PokerNews, as we are bringing you action from all over the Rio! For now, good night from Las Vegas! Mark Radoja raised to 100,000 on the button, and Matt Matros called. The flop came down , and Matros check called a bet of 100,000. The turn was the , and Matros led out for 175,000, and Radoja raised it up to 475,000. Matros asked him what he had behind, and after about a minute, shoved all in. Radoja snap called, and the cards were tabled. Radoja had turned a straight, and would need to just dodge a heart on the river to win the pot. He couldn't do it, as the hit the river. Radoja will take home $281,502 for his efforts, falling just short of his 2nd bracelet. 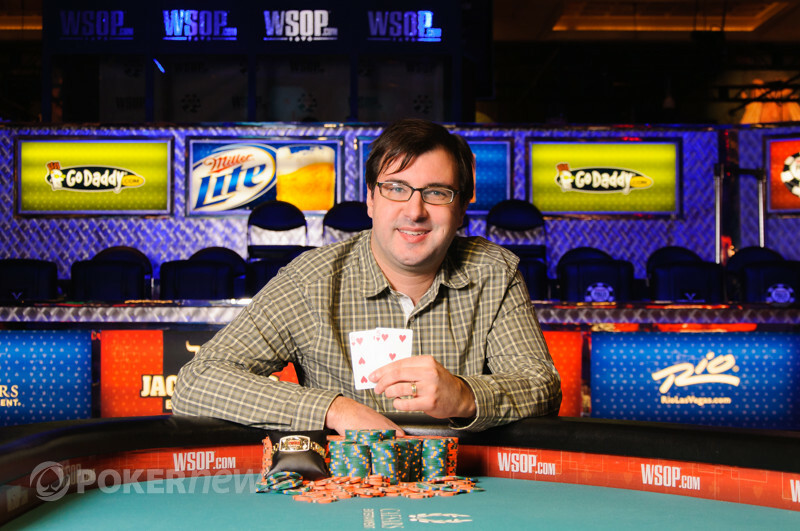 Matt Matros raised to 100,000, and Mark Radoja three bet to 230,000. Matros called, and the flop came down . Radoja continuation bet to 225,000, and Matros raised to 500,000. Radoja folded, and he dropped to under two million after the hand. Matt Matros had taken a handful of small pots to draw virtually even with Mark Radoja, and he has just won the biggest pot of the tournament to change the tide in this heads up duel. Action started with Radoja making the standard button min-raise, and Matros called. The dealer fanned out a flop of , and Matros check called a 100,000 bet. The turn brought the , and Matros checked again. Radoja bet 250,000, and Matros went into the tank. He eventually announced raise, and put in a bet of 625,000 total. Radoja took only about 15 seconds to slide in the call, and the river was the , Matros announced a bet of 725,000, and slid it into the middle. This sent Radoja deep into the tank. After about 30 seconds, Radoja started talking to himself. "What do you have?" he asked in a very confused tone. He then tanked for about another minute, before picking his cards up like he was going to fold. He put them back down, then counted out the calling chips. Another 30 seconds went by, and he picked his cards up again, as though his hand wanted to fold them, but his brain wouldn't let him. Finally, after almost five minutes in the tank, Radoja called. Matros tabled for two pair, and Radoja mucked his hand. This pot propelled Matros to 5.1 million, and he's taken the chip lead for the first time since we started heads up play. Mark Radoja min-raised on the button, and Matt Matros called. The dealer laid down the on the flop, and Matros check called a bet of 100,000. The hit the turn, and this time, Matros check called a bet of 225,000. The paired the board on the river, and Matros checked a third time. This time, Radoja checked, and Matros grimaced as he tabled for a full house. For the entire heads up battle, the preflop action has either been a fold from the button, or a min raise that led to a call or three bet. Matt Matros made the first four bet of the match, and Mark Radoja responded by making the first five bet! Matt Matros raised it up to 100,000, and Radoja three bet to 230,000. Matros thought it over for a bit before putting out a four bet to 500,000 even. Radoja weighed his options, then slid out a five bet to 1.3 million. Matros thought for about 30 seconds before giving his hand up, and Radoja has taken control of the heads up match once again. Matt Matros was on the button, and he raised it up to 100,000. Mark Radoja called, and the dealer laid out a flop of . Radoja checked to Matros, who fired out 100,000. Radoja check raised to 250,000, and Matros made the call. The hit the turn, and Radoja checked again. Matros was not scared by the check raise on the flop, and led out again, this time for 300,000. It was enough to do the job, as Radoja released his hand. 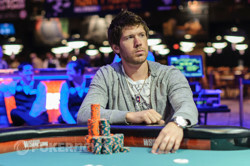 Matt Matros raised to 100,000 on the button, and Mark Radoja three bet to 230,000. The flop came , and Radoja led out 250,000. Matros tanked for a couple of minutes before making the call, and the turn came the . Radoja fired out 450,000, and it was on Matros. After about a minute if thought, he moved all in for 940,000 on top. Radoja tanked, but let his hand go, giving the bit pot to Matros. Matt Matros raised it up to 80,000m and Mark Radoja reraised to 210,000. Matros called, and the flop ran down . Radoja continuation bet for 250,000, and Matros called. They both checked the on the turn, and the river brought the . Radoja fired out 360,000, and Matros simply shook his head as he folded his hand. 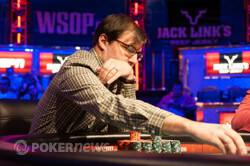 Day 3 Almost Head: Will Matusow Get #4?